As some of you know, "Deadenders" quickly grew into one of my favorite series--hearing of its demise made me lose a bit of confidence in the comics industry. I don't usually latch onto a new series that quickly. Thankfully, Ed isn't going anywhere soon. I must confess that I read "Batman" #582-585 pretty fast--I wasn't prepared for it to be such a fast read. Not that there's anything wrong with that. It seems the focus on Ed's brief 5 issue run, before he shows back up later on, is on a vendetta Batman carries out against the Penguin, and the little people caught in the cross-fire. There's something new about Scott McDaniel's artwork--I just can't put my finger on it. The characters appear the same (the same expressive faces, dynamism, Batman's a ton of muscles, etc. ), but something's changed. Maybe it's the angles he's choosing and the dark/light contrasts--but it looks damn good. I really wish I could figure out what's been tweaked cause I'm at a loss. #582--Part 1 of "Fearless" gives us a man who died years ago. Now, after his release from prison he engineers a fantastic last ride--one that will guarentee his end and ignite a war that will consume Batman. Batman finds himself letting his emotions get the best of him--as a result, he is duped into a series of uncharacteristic moves, including allowing a mysterious outsider to "map" his every move... Given the restraint that comes with CCA books, I kind of wish Ed was allowed to let loose--the word choice seemed restricted. #583--Part 2 of "Fearless" reveals the strange new villain and allows Batman to uncover his once friend's dangerous final move. Stories revealing new "friends" into Batman's past are usually pretty lame, but this one works. Seeing Batman behave as a man, and his confusion as to best handle the situation is priceless. Ed suggests Zeiss is an agent of Luthor, but Ra's isn't out of the question (Zeiss does call Batman "Detective"). 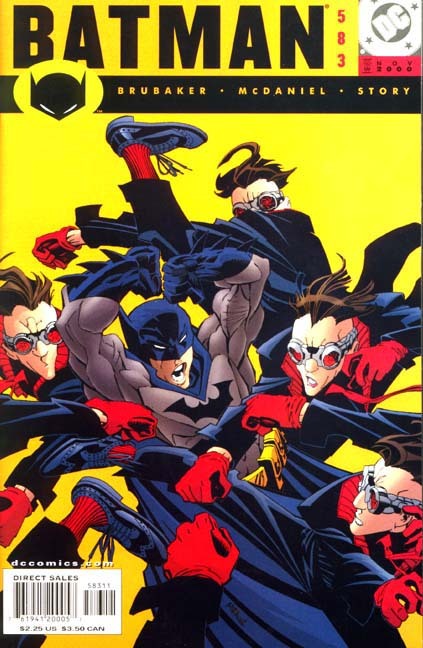 #584--"The Dark Knight Project" is my favorite of all these issues. Scott McDaniel is given a lot to work with--between two amateur filmmakers duped by the Penguin into making the biggest mistakes of their lives and Batman's frantic attempt to save them, there's a lot on the plate. I love how Scott draws things getting thrown out of a glass windows. Batman discussing his motives with the filmmakers out of Arkham while pulling a sharpened spoon out of his ribs was a classic moment. #585--"Measure for Measure" continues the trend of "Gotham Nights"-ish flair (i.e. Batman and Gothamites' relationship). Batman finds himself growing further and further entangled in the minutae of Penguin's criminal empire, to the point where the big fish are getting away. A conversation w/ Jim Gordon helps to set things straight. Scott's "new" art style is dazzling me--I guess it's dark vs. light contrasts or something, because I've never seen his figures look that sharp! The dive-by attempt scene was executed brilliantly. A very satisfactory beginning--the roots being laid here should lead to an explosive outcome down the road.